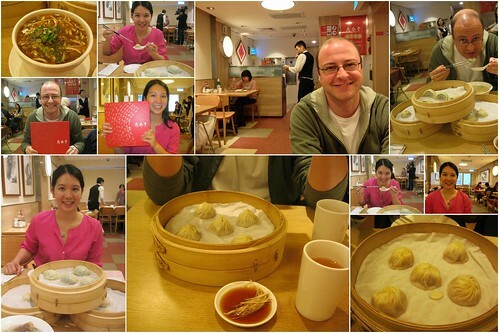 After leaving Taipei 101 we decided to get a late lunch at Din Tai Fung. 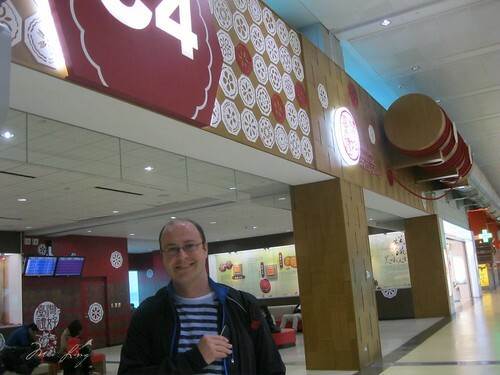 Rather than stay and go to the Din Tai Fung located in 101 (which is apparently the largest location in Taipei) we opted to take the MRT to Dongmen Station so that we could visit its flagship location in Xinyi. At this point it was close to 3 p.m. so they were able to seat us quickly in the restaurant. 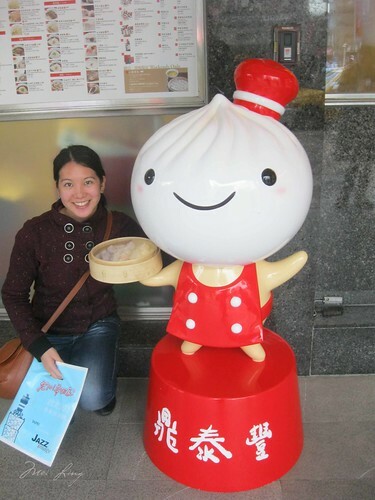 We ordered their signature xiao long bao and a few other variations of it as well as dumplings and hot and sour soup. 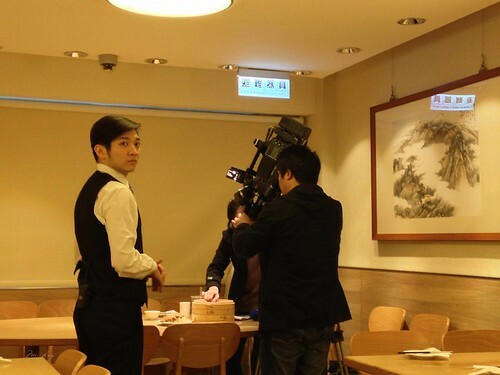 There was a film crew shooting something at the restaurant and when they were done they got to eat the food. Sounds like my kind of job! Eating in Din Tai Fung. It was amazing! 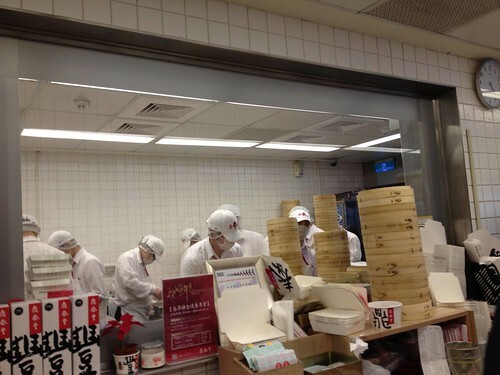 Filming at Din Tai Fung. 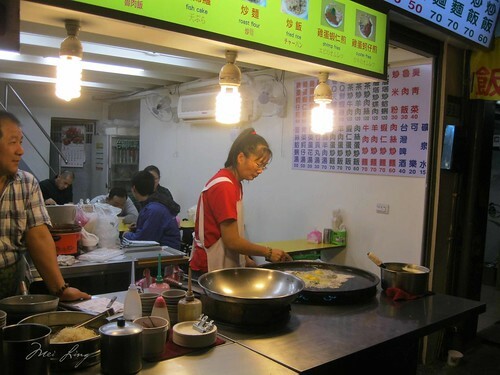 You can see them making xiao long bao in the kitchen. Yum! 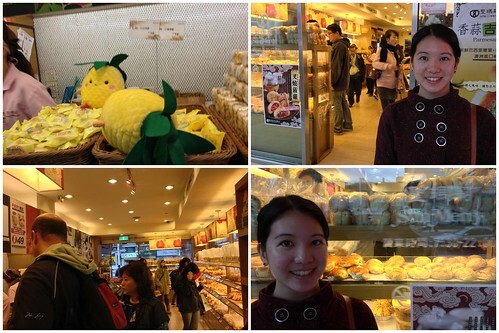 After stuffing ourselves at Din Tai Fung we visited Sunmerry Bakery and bought their signature pineapple cake. 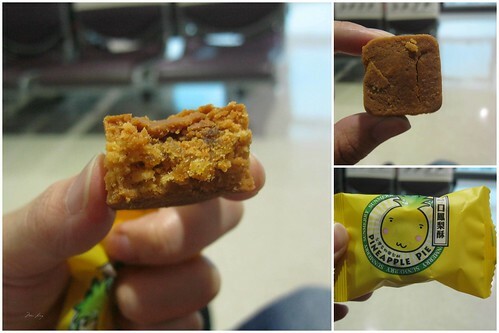 Their pineapple cakes are the flakiest most delicious pineapple cakes I’ve ever tasted. I also bought some bite sized versions and some for me to snack on. 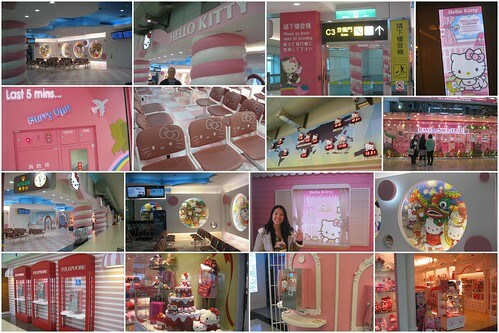 Inside Sunmerry Bakery. Their pineapple cakes were the best I’d ever eaten! From here we visited Ten Ren Tea. I love Ten Ren and had been looking for it everywhere and was disappointed to find that the location near our hotel hadn’t opened yet. 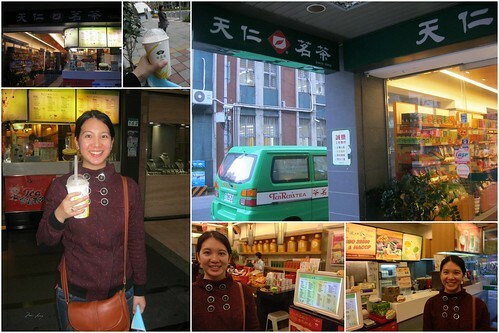 It was strange to me that I could find more McDonald’s and Starbucks stores than Ten Ren. I love Ten Ren and drink their bubble tea all the time in Toronto. 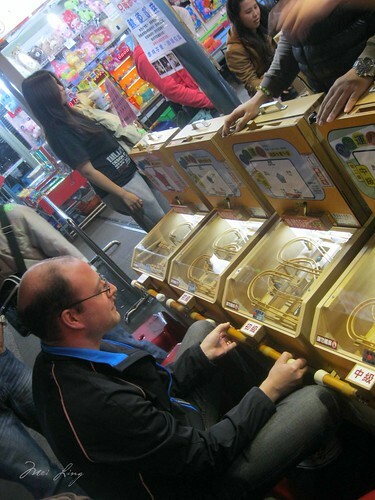 I even found a location in Melbourne when I was there in 2007. 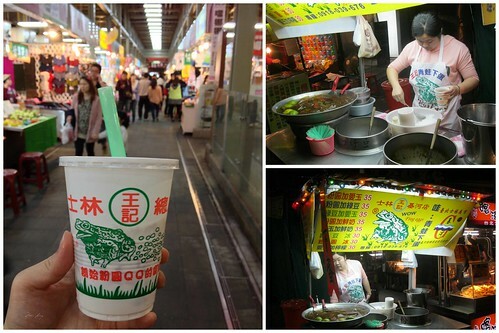 Enjoying bubble tea from Ten Ren. I ordered a milk black tea with pearls (also known as “original flavour” in Mandarin). They asked if I wanted ice or no ice so I opted for no ice (they don’t ordinarily ask this in the stores in Toronto, so this was a neat experience for me). 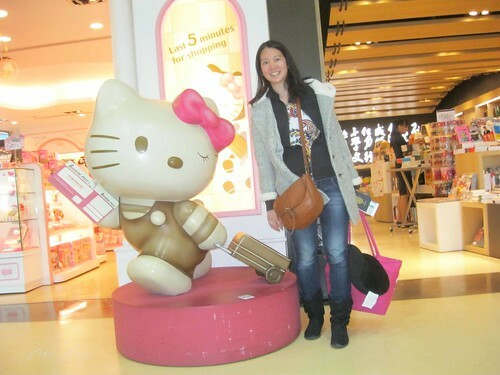 I enjoyed my tea and then we hopped on the MRT again and went to Ximen Station. 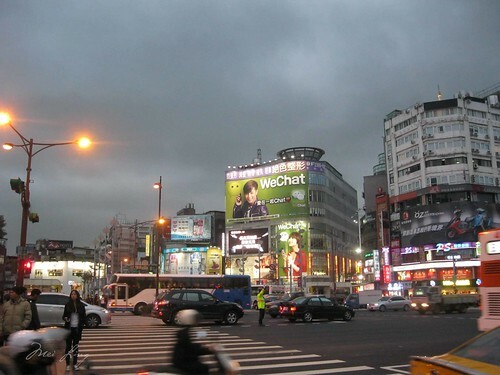 Ximending is the hip shopping district in Taipei. We took a quick look around and also admired the history Red House Theatre before moving onto our next stop (apparently I wasn’t in much of a mood to shop on this trip). 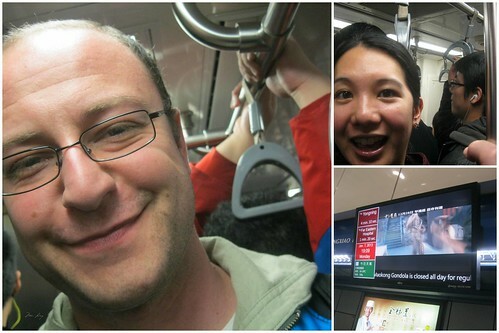 We took the MRT again (this was a heavy MRT day) to Jiannan Road Station. From here we walked to Miramar Entertainment Park, which is part of a shopping complex. 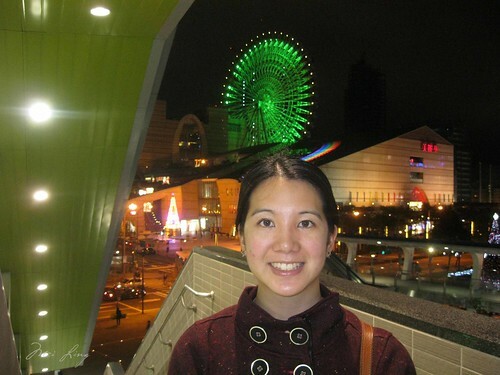 I was interested in riding the Ferris wheel here (I also love to ride cheesy Ferris wheels on vacation). At 70 metres high, the Miramar Ferris wheel, which is located on the roof of the Entertainment Park, is the second highest Ferris wheel in Taiwan. 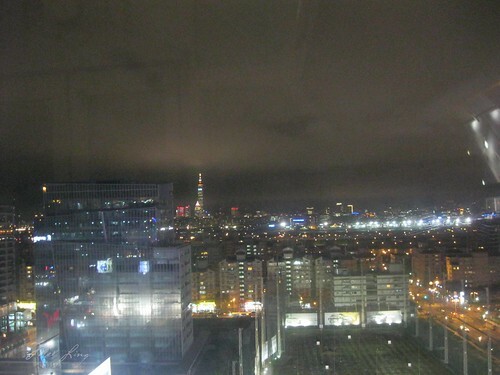 It cost 150 NT to ride the Ferris wheel and the view wasn’t bad. 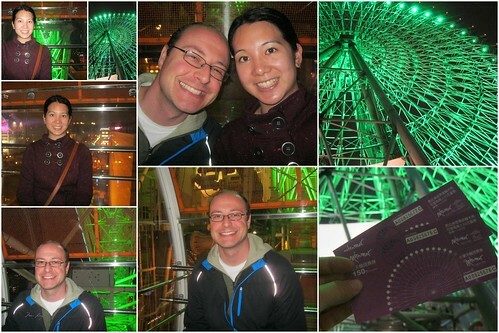 It was kind of fun, but definitely not a must see in Taipei (unless you have a thing for Ferris wheels like I do). 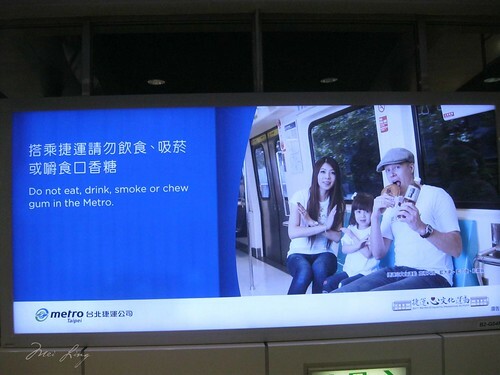 Next, we took the MRT to Shilin Station. 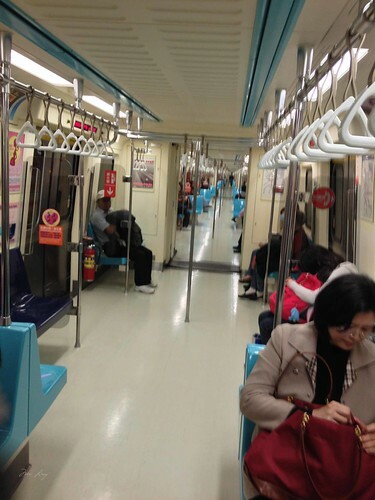 The MRT was jam packed. 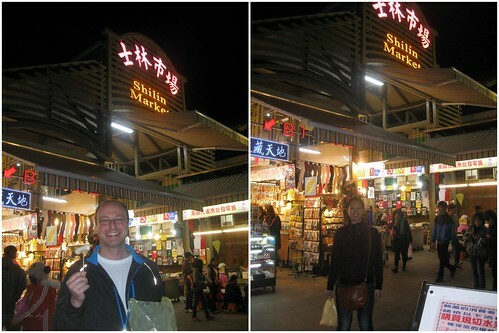 From Shilin Station we finally made it to something else that Taiwan is famous for, their night markets. 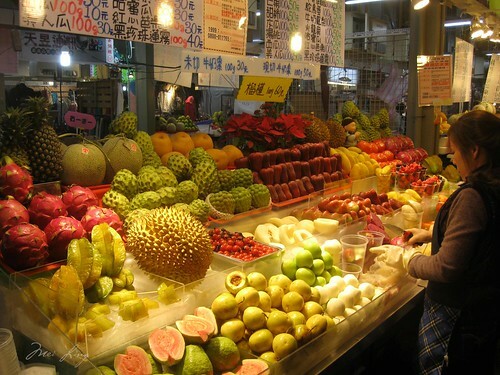 Shilin Night Market is one of the most famous night markets in Taiwan and also the one that all the tourists go to. 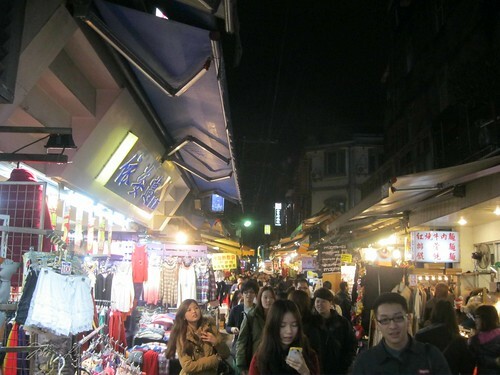 I know there are other better night markets, but since we were short on time we figured that if we were to go to just one, it would be this one. 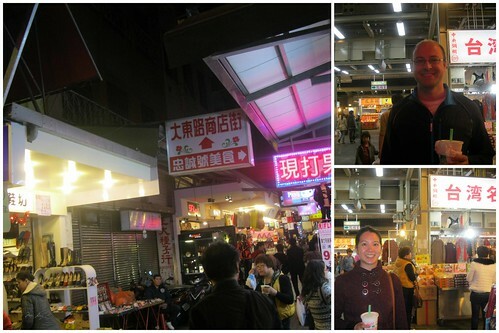 We spent some time wandering around and looking at all of the stalls. 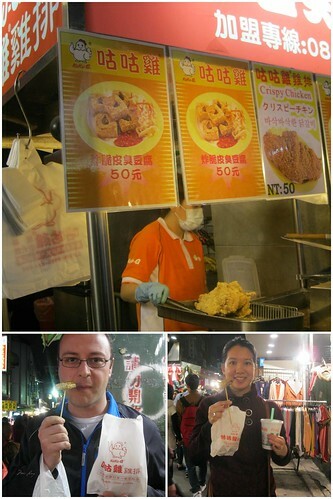 I bought us some aiyu jelly drinks and some fried chicken on a stick. Yum! 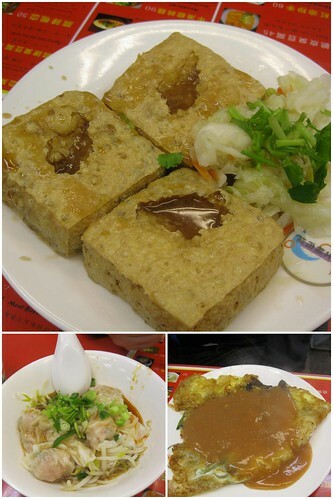 We also had stinky tofu and an oyster omelette, two staple night market foods. I don’t think we went to the best place for them. Next time I’ll read up on what stalls we should visit. 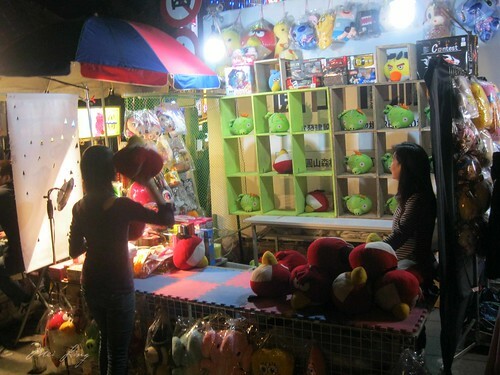 Afterwards we bought some fruit from a fruit stand and also played some games. Dan tried game where you had to balance a marble on wooden slats and navigate it through a maze without falling off. 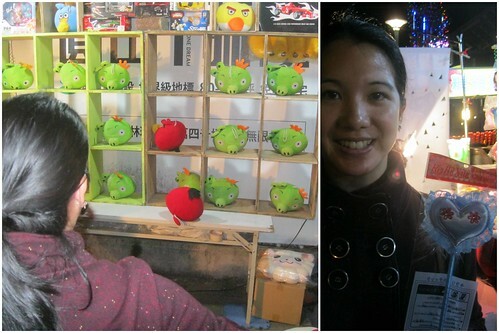 I also played an Angry Birds game (I love Angry Birds!). When we got back to the hotel I was pleased to find one of my favourite Taiwan dramas on t.v., In Time With You. It was strange that they were airing it since it’s a little older, but that worked out for me. 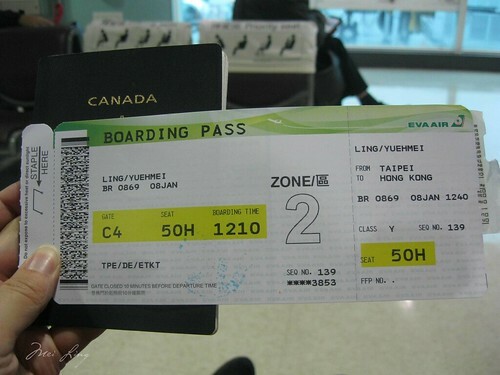 The next day we checked out of our hotel and went to the airport. 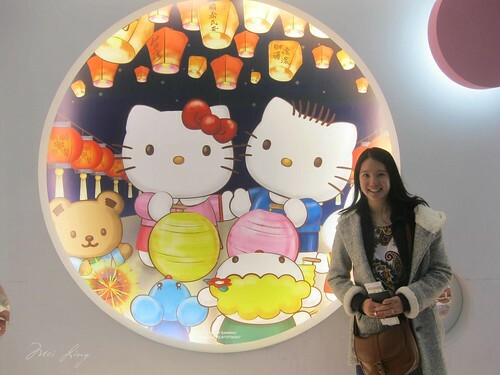 Our gate was next to the Hello Kitty themed gate, so naturally I had to go to the Helly Kitty themed gate and take pictures. 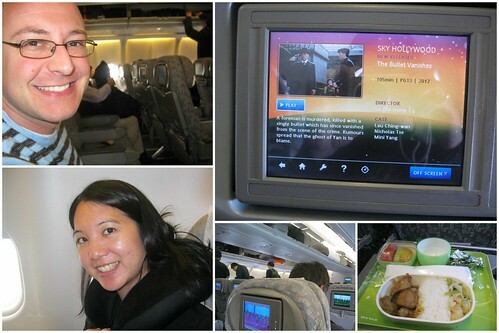 The flight back to Hong Kong with Eva Air was smooth and just as comfortable as the way to Taiwan. I managed to watch a movie, The Bullet Vanishes. I almost didn’t get a chance to see the end but I put the subtitles on as we were landing and read them as the film was ending as we were getting ready to disembark from the plane. Because of this, I don’t quite remember the ending but I do remember feeling a little disappointed by a plot twist. 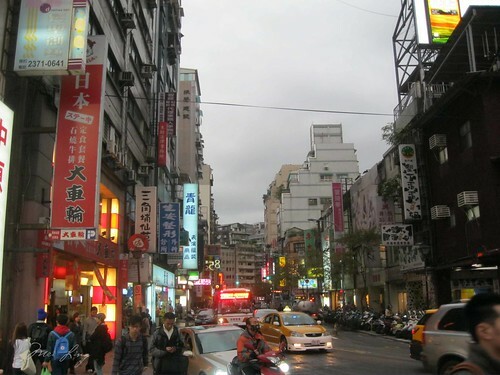 Overall we had a great trip to Taiwan and really enjoyed exploring Taipei and the areas around it. 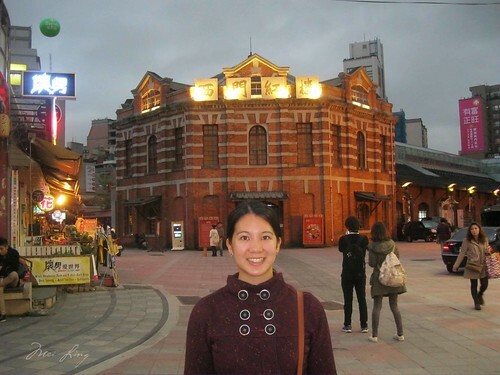 I hope that we can come back someday and see more of the country (maybe enjoy a day or two without rain, though I can’t complain since there weren’t any typhoons). 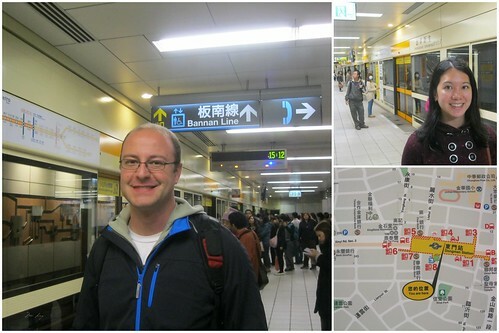 As I’ve mentioned before, the people in Taiwan are friendly, helpful and courteous and it’s fairly easy to get around on their incredible transit system.